San Diego, Calif., Jan. 4, 2018 -- A team of researchers at the University of California San Diego has developed macrophage “nanosponges” that can safely absorb and remove molecules from the bloodstream that are known to trigger sepsis. These macrophage nanosponges, which are nanoparticles cloaked in the cell membranes of macrophages, have so far improved survival rates in mice with sepsis. This work is one example of the cell membrane cloaking technology pioneered by the lab of Liangfang Zhang, a professor of nanoengineering at the UC San Diego Jacobs School of Engineering. His group develops new nanomedicine therapies by disguising nanoparticles as the body’s own cells. Previous examples include red blood cell nanosponges to combat and prevent MRSA infections; nanoparticles cloaked in platelet cell membranes to repair wounded blood vessels; and nanofibers cloaked in beta cell membranes that could be used to help diabetes patients produce more insulin. In the current study, Zhang’s lab developed macrophage nanosponges that offer a promising solution for effectively treating and managing sepsis. Zhang’s lab collaborated with Victor Nizet, a professor of pediatrics and pharmacy at UC San Diego, whose team helped test the macrophage nanosponges in vivo. 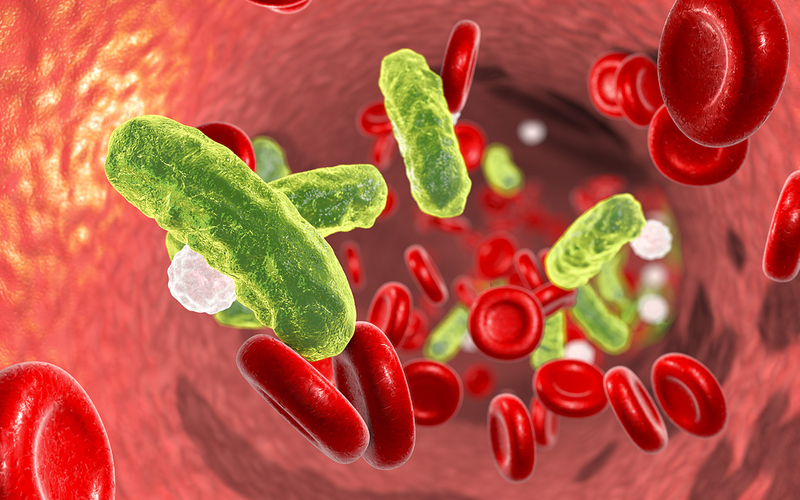 Sepsis occurs when the body launches an uncontrolled immune response to an infection, triggering widespread inflammation that can lead to organ failure, septic shock and even death. The U.S. Centers for Disease Control and Prevention estimate that more than 1.5 million Americans get sepsis and about 250,000 die from this condition each year. Sepsis is usually treated with antibiotics. But while antibiotics can potentially eliminate sepsis-causing bacteria, they can’t keep inflammation in check. Some sepsis-causing bacteria secrete toxic molecules called endotoxins. Macrophages—white blood cells that play a major role in inflammation—recognize endotoxins as dangerous. In response, macrophages produce inflammation-causing proteins called pro-inflammatory cytokines, which in turn activate other macrophages to produce more cytokines, setting off a dangerous domino effect of inflammation throughout the body. “To effectively manage sepsis, you need to manage this cytokine storm,” said Zhang. In a paper published in Proceedings of the National Academy of Sciences, Zhang and a team of researchers at UC San Diego showed that macrophage nanosponges can safely neutralize both endotoxins and pro-inflammatory cytokines in the bloodstream. A wide range of endotoxins and pro-inflammatory cytokines naturally bind to macrophage cell membranes, so these nanosponges serve as universal traps for a broad spectrum of sepsis-causing molecules, Zhang explained. “They can work across different bacterial genus, species and strains,” he said. And since they are covered in actual macrophage cell membranes, they can pass as the body’s own immune cells and circulate the bloodstream without being evicted. Researchers used macrophage cells from mice to make the nanosponges. They soaked the cells in a solution that made the cells burst, leaving the membranes behind. The membranes were collected using a centrifuge, then mixed with ball-shaped nanoparticles made of biodegradable polymer. The mixing step spontaneously coated the nanoparticles in macrophage cell membranes. The team administered the macrophage nanosponges to a group of mice infected with a lethal dose of E. coli. The treatment kept four out of 10 mice in this group alive, while all mice in the untreated group died. One dose of the macrophage nanosponges significantly reduced the levels of endotoxins and pro-inflammatory cytokines in the treated mice. This prevented systemic inflammation and also reduced the bacterial count in the blood and spleen of these mice. Zhang is working with biopharmaceutical companies to translate the macrophage nanosponges into clinical use. Next steps include manufacturing the nanosponges in large scales and conducting large animal trials. This work is supported by the National Science Foundation (grant DMR-1505699), the Defense Threat Reduction Agency Joint Science and Technology Office for Chemical and Biological Defense (grant HDTRA1-14-1-0064) and the National Institutes of Health (grant 1R01HL125352). Paper title: “Macrophage-like nanoparticles concurrently absorbing endotoxins and proinflammatory cytokines for sepsis management.” Authors of the study are Soracha Thamphiwatana*, Pavimol Angsantikul*, Tamara Escajadillo*, Qiangzhe Zhang, Joshua Olson, Brian T. Luk, Sophia Zhang, Ronnie H. Fang, Weiwei Gao, Victor Nizet and Liangfang Zhang at UC San Diego.